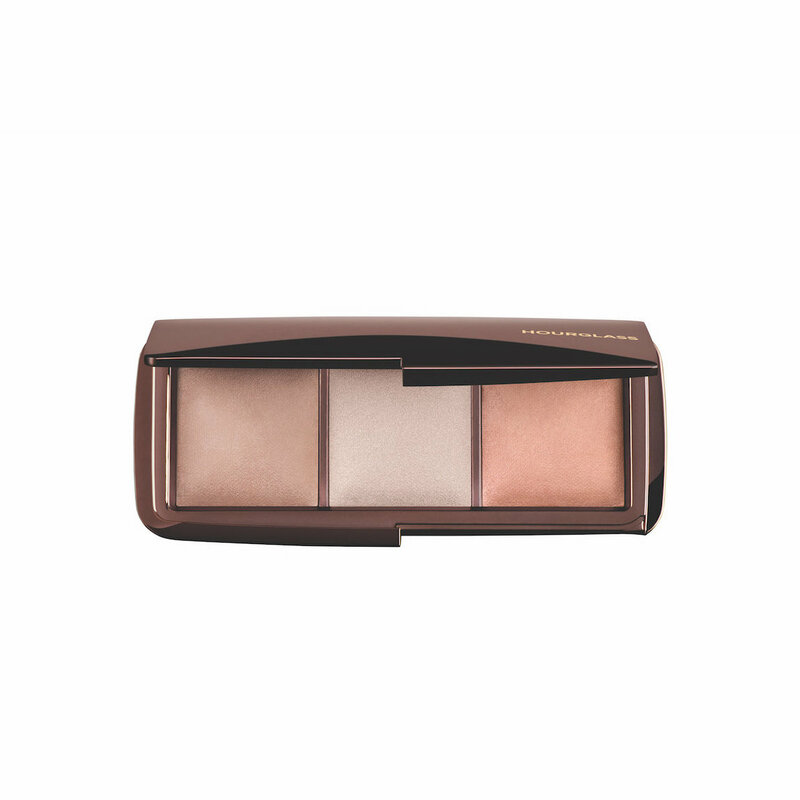 Create your perfect light with three shades of Hourglass’s cult-favorite Ambient Lighting Powder in a sleek palette. Each of these high-tech, soft-focus finishing powders recreates a flattering type of light to imbue skin with a natural, dreamy luminosity. Photoluminescent Technology captures, filters, and diffuses surrounding light to instantly soften and refine your complexion. Dust Dim Light all over the face with a powder brush, focusing on the center of the face to soften imperfections. Add Radiant Light as a contour under the cheekbones, on the temples, and along the bridge of the nose. Finish with a light dusting of Incandescent Light on the tops of the cheekbones, under the brow, on the eyelids, along the bridge of the nose, and on the cupid’s bow to brighten. Tip for deeper skin tones: Test the product on your skin and make adjustments by adding Radiant Light for more depth. I thought this was super expensive, but I've heard so many people love this so I decided to try it. I AM IN LOVE, it allows my face to glow. 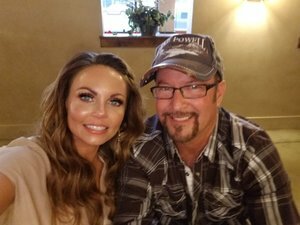 I went to dinner with my husband and they snapped this picture, my FACE WAS GLOWING and it was because of this product. It's not to shimmery, not to highlighted, but it's a healthy looking glow that lasts all day. I LOVE this stuff. My only regret was not buying it sooner. This is truly magical powder. I do not know how they do it, but this just makes you look heathier, smoother and brighter. Well worth the money, and this does last and last. This is my very first Hourglass product and yes the main reason for buying it was due to the high cult status it has achieved across the blog/vlog world of beauty it seemed like a too good to be true and the packaging is beautiful. So of course I got sucked in to buying it, but it does now take prize position on my table. The cutest of this palette isn't in your face, it's subtle with its burgundy glossy dark plastic casing that is quite thick, to the really tight closed opening that requires both hands to open it as its sat on the side of the palette and is designed to blend into the shape of the case with its jutted out edge. Inside the hinges make it slightly stiff to open but not in a "oh my god its going to break" way but it is in fact the quality of the hinges and the design which is just a luxurious item. You feel 100% pretty and more important just holding it. The large mirror is almost borderless so you get a decent size if you use the mirror which would be handy when travelling as you won't need to take a handheld one with this. The 3 powders are slighty domed but still squared in their seats, which has them raised in the middle and the colours that are delicated swirled with hints of silvers and gold through them just gives it a one of a kind effect as if it was made by hand for you. Formula of the powders seem slightly chalky to begin with but after the first application it seems to remove the top layer and reveal a delicate cream/powder softness but not crumbly texture that blends effortlessly on your face. These are not overly pigmented and you won't get a highly intense highlight effect but it creates an almost romantic glow and brightness to your face when used in a way to give you a more healthy, younger appearance. Incandescent Light - The middle glowing pearl white that is the most used and is sinking fast!! it brightens and makes my face appear more youthful and even looking. It is just a luxury feel, elegant edition to my makeup collection and although I don't use all 3 of the powders it is totally worth it for the limited edition incandescent light, as it is only available in this palette at that time. I am not one for blinding highlight (there is a place and time). This highlight I like to use every time I put makeup on for university or when I'm going out it is subtle and it looks like I am glowing, but it is not too obvious. Beautiful but expensive, efficacy questionable! This palette is so elegant and beautiful, inside and out! And the effect on skin is nice, but I feel that it doesn't REALLY do anything. I'm wondering if we've all been duped by the marketing and the hype of beauty bloggers surrounding this product, and it's just a very subtle highlighting product. I just don't know if it really does anything for my skin or finishing my makeup, but it sure is pretty. Overall, I really like this palette, it’s literally a one stop shop! You can use this palette for contouring, as a bronzer, blush, highlighter or finishing powder. The colors work for my entire face and have amazing staying power especially when used with a light mist of setting spray. The texture is superfine so less is more. Two of my favorite things are that when I use this product I don’t look glittery or oily, I simply have a nice healthy glow. After my first use I took pictures just for fun and wow I looked great lol! I have a deeper skin tone so I use Radiant on top of the other colors and it’s perfect! I highly recommend this product for anyone who would like to achieve a natural looking glow without the chrome look of a typical highlighter. I was very excited to try this pallet it was my 1st hourglass purchase, I heard so many great reviews on the single pans when this one came out I had to try it. Of all the 3 shades in this pallet I use dim light the most for the top of my cheek bones up to my hair line I already contour prior to using this so it just adds a nice finish, I also use incandescent light under the eye area and above brows sometimes over another highlighter or alone. The shade I do not use to often is the radiant light it is a bit to shimmery and if I do use it I apply it to the lower part of my face and my nose, it reminds me of just a very sparkly bronzer which when I do bronze I perfer a completely matte formula. I'm in love with the Incandescent shade, but I only wish it was not exclusive to this palette. I think overall this palette does a decent job at highlighting, but there are certainly better products for less. Might consider buying again, but only for that one shade. Very good powder, fine, almost not detectable. I can use all shades. The darker one I use as blush.